In the heart of Sag Harbor, William Cummings and Bernt Heiberg transform an unassuming beach shack into a mid-century modernized home with Scandinavian flair. If the word “whistles” conjures up gold faucets, chintz couches or a lavishly appointed interior, you’re not tuned into the pair’s signature Scandinavian style, which is both rustic and chic. Known for their spare-but-not-spartan interiors, they initially focused on adding space, not stuff, working with Southampton architect Shawn Leonard and contractor Bill Flanzer to judiciously maintain the scale of the property while making it taller. The addition of two floors allowed for four bedrooms and four full baths, as well as an airy, spacious living room and a large open kitchen with a massive center island. 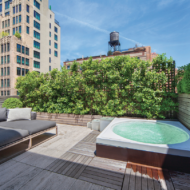 Amenities such as a steam shower, an outdoor bathtub and floor-to-basement laundry chutes show the practical and intelligent mindset behind the simply curated spaces, inside and out. Texture plays a big part in the balanced palette of white, tan and gray that dominates the rooms. Wood stools, matte-metal side tables and blond woven-basket lampshades enhance the neutrals. Artwork is by Beth O’Donnell, with a large piece over the sofa that was curated by Belinda Kielland. “I don’t really like color myself,” states Heiberg, not at all sheepishly either. Still, he admits, brown and black can give an interior depth and a level of chic, and in the living room, the addition of a dark-chocolate leather chair, or stark black pillows on a white Belgian linen couch, prove that point. 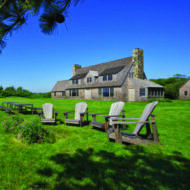 French doors open up to the pool and pebbled garden area, which are surrounded by grasses and plants landscaped by John Verderber, Jr.. “When the doors are open, you see beach grasses, wild roses and bamboo,” says Heiberg. 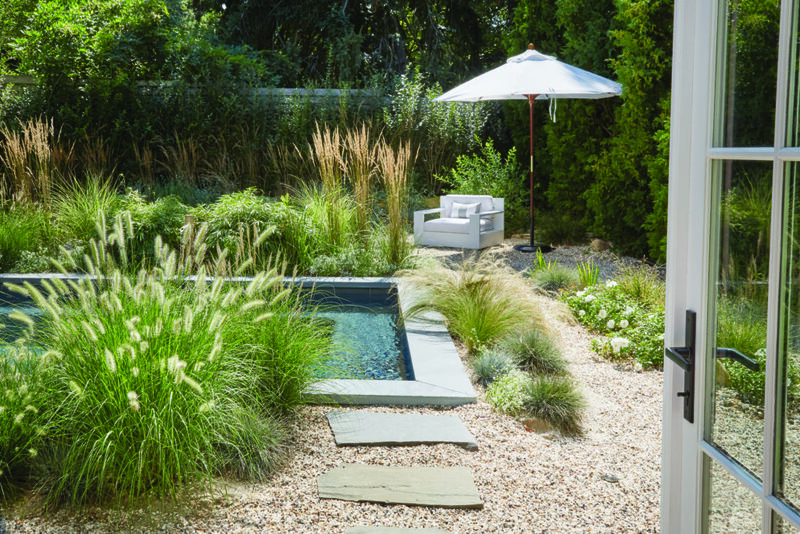 “It’s very beachy, a dream of a garden.” A bamboo fountain flows into the pool, and when breezes blow the tall grasses, the sounds have a calming effect, even when the Coco residence is a full house on the weekends. “We socialize, and work here, a lot,” explains Heiberg. He, Cummings and their miniature dachshund Fia head out from their West Village apartment early in the week, in their white Ford Mustang convertible. 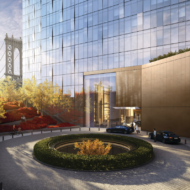 “New York City is amazing, but it can be a brutal city at times, and out here we feel like we’re really living,” says Heiberg, who was born in Norway. Cummings was born in Colorado and grew up in San Francisco.